Book an economic private taxi from Malaga airport to Fuengirola with our transfer services filling in the form on the top. Distance from Malaga: 24 km. Fuengirola is one of the favourite places for tourists to spend their holidays on the Costa del Sol. The town is situated among other tourism references such as Benalmadena, Mijas Pueblo or Marbella. Here we provide information on the most interesting places to visit, those places that make repeat visitors each year. By train from Malaga airport to Fuengirola: The train is an efficient means of transportation to get to this town. Take the suburban train at the exit of the Terminal 3 at the airport. It stops at Los Boliches or the centre of Fuengirola in a journey that takes about 35 minutes. Public transport in Malaga works great and you can take a bus near the airport that will take you to the bus station in Fuengirola. 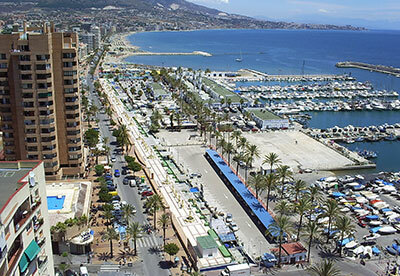 The only drawback is that Portillo has no buses at the airport to this particular destination and you will have to walk to the road where passes a bus route to Fuengirola. Transfers: Our services offer an excellent option for traveling to Fuengirola during your holiday. We have standard, executive and luxury cars to transfer you from the airport to your hotel in this town. We also have a fleet of minibuses to transport a total of 12 or 19 travellers, and we even have buses up to 54 people. 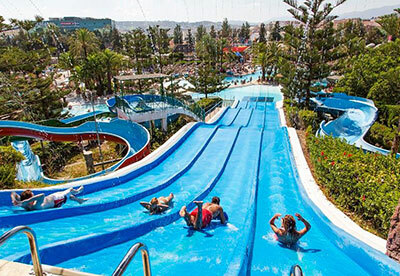 What to see and visit in Fuengirola? 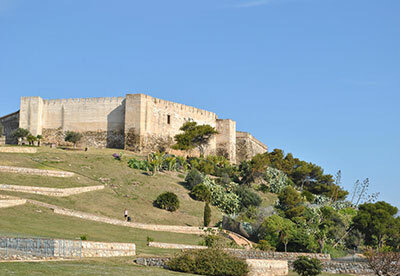 Sohail Castle, an ancient fortress and nowadays a monument, is located on the outskirts of the city near the beach and the river; the castle is especially busy during the Medieval Fair of Fuengirola held in mid to late August. During the event, the fortress transforms into a medieval market, full of typical items of this period of history. The sea promenade is a delight for a stroll or outdoor sports. This walk is one of the largest in Spain and connects with the seven beaches of Fuengirola: Carvajal, Torreblanca, Las Gaviotas, Los Boliches, San Francisco, Sta. Amalia and El Ejido. In the centre of the coastal area is situated the Marina of Fuengirola, a facility frequented by all tourists at some point of their visit. Areas for party and nightlife; in the town you can enjoy a great time with the nightlife of Fuengirola. There are two distinct areas, one is the area around the Marina and you can also find good pubs and bars in the centre of Fuengirola. A walk through the streets of a city is advisable on any trip, but this time it is even more. The streets of Fuengirola have a peculiar charm that make it a special place. During your walk, we recommend to look for and enjoy the beautiful Plaza de la Constitucion and a visit to the parish of Our Lady of the Rosary. In the centre of town you will find many shops, bars, restaurants and clubs that will surely catch your attention; wherever you go, Fuengirola will surprise you with good places where to spend your money chasing a souvenir of your holiday, good food, candy or any product that you fancy. For shopping, in the municipality there is a Corte Ingles Mijas Costa or the shopping centre Miramar. Not to mention the best second hand market of Malaga, located at the fairgrounds every Saturday of the year. The Mosque of Fuengirola is a Moorish temple you’ll find the western part of town, near the beach and the castle Sohail. Leisure and entertainment options for your stay in the town, other options are for example: you can see a bullfight at the Bullring situated in the city centre. 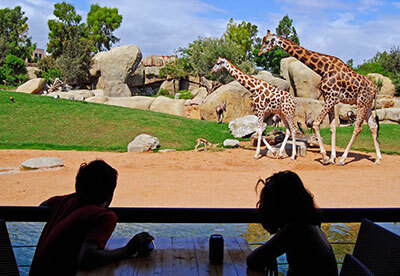 You can immerse yourself in the animal kingdom at the zoo Bioparc Fuengirola. You also have the option of watching good movies in large cinemas at Miramar Shopping Centre, or more modest cinemas but at a very attractive and affordable price at Cine Alfil, located next to the bullring and the aforementioned zoo. Last not least, you can practice a large number of sports. Fuengirola has several golf courses of good quality, highlighting: Mijas Golf, Cerrado del Aguila, El Chaparral and Santana Golf. To visit the most interesting places in Fuengirola, we suggest our service of guided excursions, day trips and tours. Book early its transport to your hotel in Fuengirola through our transfers from Malaga airport or wherever you specify.